Hire freelance writers for your next copywriting, blogging, web content writing, or other freelance writing project. Post a job ad below for just $19.95 for 30 days to reach professional writers in the 10-year All Freelance Writing community. Know exactly what you need and want to reach out to an established freelancer immediately? Browse the freelance writer directory and find the writing partner you're looking for without the wait or hassle of sorting through applications. Clients: You can also log in to edit your existing job ads if they're currently live on the site and if you were logged into an account when you posted them. (Note: expired job ads are periodically removed from the system and cannot be edited or extended. You may, however, repost another ad for the same gig for another 30 days if needed.) Accounts are not required to post a job. If you already have an account, please log in before submitting your job ad. Please enter the email address where you would like to be notified of updates regarding your job listing. This will not be published and it will not be added to any ongoing mailing list. Would you like to register for a user account (so you can edit your job postings in the future)? You chose to register for a new account so you can edit your job listings in the future. Please include your desired username here. Your account will only be created when the job ad payment is processed and your listing is approved by an admin. You will then receive an email at the address you've indicated above allowing you to set your password so you can log in and edit your job listings at any time in the future. If your desired username is not available, you will be contacted via email to continue setting up your account. Please choose the pay rate range that best describes your budget on a per article, per page, or per project basis (Note: only larger single projects should have per project budgets listed -- such as a white paper; grouping several low pay articles into one larger project budget is not acceptable, and I reserve the right to reject those ads or alter the budget information to reflect the per article or per page rate). Please describe this freelance writing job and what you would expect of candidates (whether this is a one-off or ongoing job, word count requirements, etc.). Please describe the ideal freelance writer for your project (niche experience, years of experience, educational background, etc.). Please tell writers how they can apply for your freelance writing job. Include relevant contact information or the URL for an online application form. Note: Any information included in this field can be viewed in your public job listing. The current rate for a standard 30 day job ad is $19.95. Featured job listings appear above other job listings on the job board and cost $39.95 for 30 days. Note: The most recent 5 featured jobs will also be linked on the All Freelance Writing home page. After submitting this form, you will be taken to PayPal to process your payment (via PayPal balance, credit, or debit card). That is the only payment option available at this time. Terms and conditions: There is a fee of $19.95 for a standard job posting on this job board. Approved job ads are valid for 30 days. All ads are manually reviewed for approval within 24 business hours of submission. All Freelance Writing's owner or representatives reserve the right to reject any freelance writing job ad for any reason. While this site does not place specific pay limits on gigs posted, job ads from certain types of companies with a history of exploiting freelance writers will not be accepted. These include but are not limited to content mills/farms, essay writing firms, and any client demanding writers submit custom unpaid samples to be considered for a freelance writing gig (any custom samples required for consideration must be paid). Job postings dealing with hate, gambling, payday loans, drugs, alcohol, or anything else deemed inappropriate for this site may also be rejected on a case-by-case basis. Listings will not be published until payments have been made. If you pay for an ad and it doesn't meet requirements as detailed above, you will receive a refund. 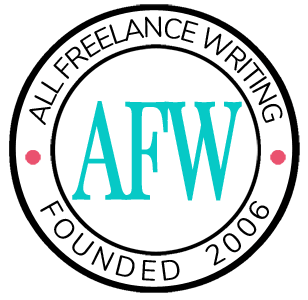 If you have questions about these terms, please contact jenn@allfreelancewriting.com.